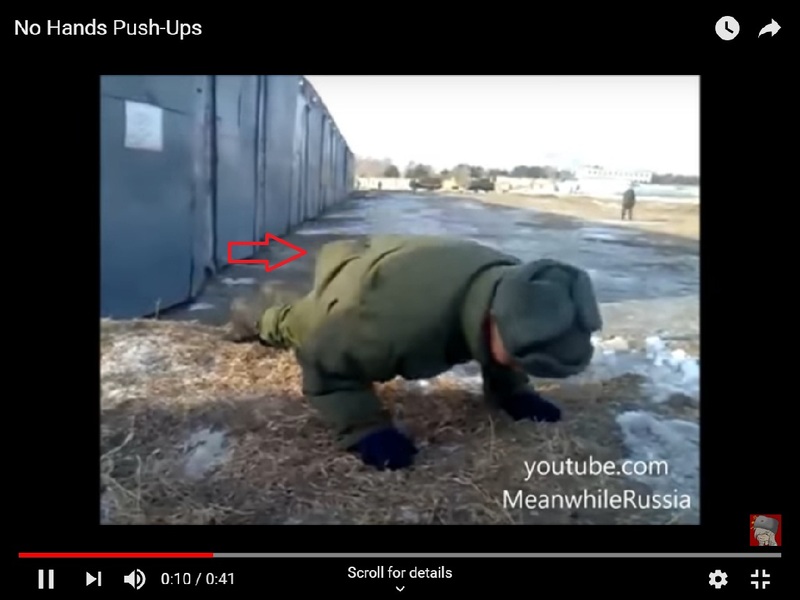 This is a top secret video of new super technic Russian soldiers adopted allowing them to do push ups WITHOUT using hands. For now only a few skilled proffesionals have been trained to do this, but the things unfolding pretty fast and whole squads of extra ability privates are being formed to date. 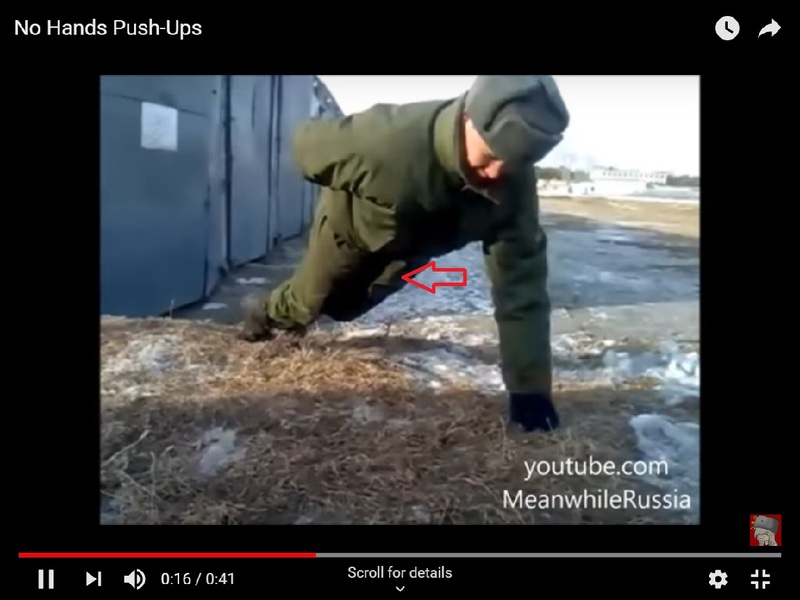 An interesting and popular video in circulation online since many years purports to show how a Russian Soldier Performs No Hands Push Ups. The video shows a soldier doing push ups on two hands, switching to do it on one hand and then does the same without any hand support. Another man probably filming the scene is heard laughing at the end. 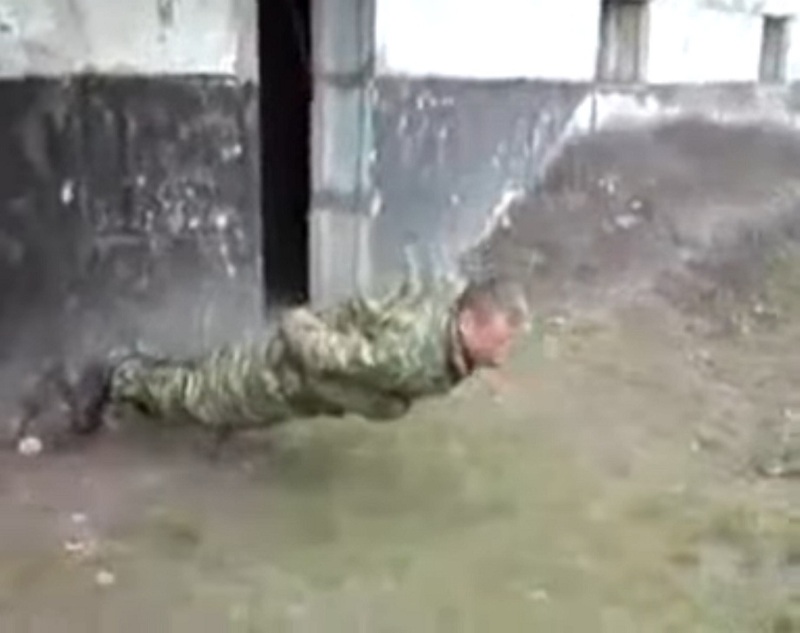 The soldier’s no hands push ups is too good to believe and viewers wondered how it is established. What is portrayed in the video is not real; the explanation for the no hands push ups is described below. We have seen the video in question appeared on LiveLeak back on 18th Feb. 2013, and it also carried a similar footage of another soldier. While the first soldier appeared to hold his feet somewhat into the ground, the other soldier held his legs onto a wall. You can see the second part of the video below. Note, the LiveLeak user who posted the video, Mister E was mostly sharing funny videos in his channel. Subsequently, the first part of the video appeared on YouTube – mostly as memes. Firstly, like shown in the video(s), it is highly improbable a person can perform no hands push ups – considering physics and center of gravity. And then there are certain visible flaws in the footage. While doing regular push ups on two hands and single one, there’s minimal pressure on the man’s hands. He’s doing it effortlessly, as if something or someone is suspending him in support. At times, the upper body of the man is also not quite stable while doing the push ups. Moreover, there are some pixel hints of video editing in the low-quality video. Similar are the flaws in case of the other video also. The revelation comes at one point of time in the video just before the soldier shifts to one hand push up. As you can see in the image below, something like a white color band is wrapped beneath the soldier’s right leg near thigh. Strangely, you can also see a cap resting on back of his body as if it is covering something. All this and the flaws mentioned above are clearly suggestive the soldier is not performing no hands push ups but is suspended by something supporting him around his waist. Another man heard laughing in the video indicates the unusual feat in the video was only staged as part of some prank.